Few artists at Santo Domingo Pueblo are in the same league as Kenny Aguilar and Angie Crespin for sheer skill and perfection in their beadmaking. So there are fewer necklaces available from Kenny and Angie than from nearly all other artists and their necklaces command a premium because of the time put into making perfect beads. When this is worn, the four strands overlap as shown in the photographs above. Kenny and Angie are well-known for this overlapping, roped effect of their silky smooth strands. Like many of the husband-wife duos from Santo Domingo, the husband (Kenny) makes the beads and the wife (Angie) does the stringing. This combination of art and skill yields magic every time with Kenny and Angie. But back up to before the process even starts when the materials are chosen; there you'll find a difference immediately. Beads like this are made from the best rock, fashioned into perfect, smoothly graduated sizes and strung perfectly. This wonderfully variegated blue-green Kingman turquoise, stabilized to prevent fracturing and breakage, is rich with matrix. Our taste runs to this sort of look in terms of color and visual busy-ness to the strands. The Santo Domingo artisans also prefer such turquoise for their beadmaking because it is so rich with character. Interestingly enough, they will always offer their clearest blue turquoise with little or no matrix as the best example of their work. But after talking and getting to know the people who make these pieces, one learns that they offer the clear blue first because they think that's what all buyers prefer. 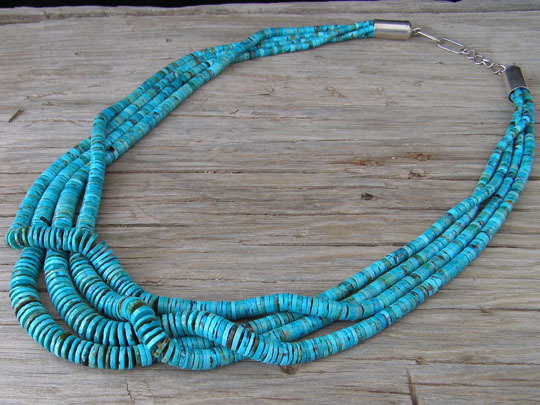 But in talking about the turquoise (how it cuts and works and how they choose the rough rocks), one almost always learns that the artisans themselves, on an aesthetic basis, prefer such strands with matrix throughout and variegated color. To make these strands round out perfectly in front, tiny baby olive shell heishi beads are strung between the disk beads. This also helps the smoothly intertwined overlap of the strands. This is strung on traditional beading string and finished off with Sterling cylinder caps with softly rounded ends.